Note: Forgive the T.S. Eliot epigraph at the outset of this post. Feel free to consider it an epitaph, both since it comes under the subtitle The Burial of the Dead in Eliot’s poem, and also because it is a fairly accurate, if unduly eloquent, paraphrase of the Atlanta Hawks cycle of mediocrity in recent years. A healthy dose of regular season success, the institutional and commercial hope that comes with “being in the playoff picture” in April: these things help a team forget that they have no real hope, no real chance to compete for the sport’s ultimate prize. Again, forgive the literary intrusion. On with it. Strengths: All of a sudden, the Atlanta Hawks strength is their future. Right now, I’m trying desperately to create a mock-up of a Danny Ferry statue outside of Philips Arena on Microsoft Paint. Some history to put this in perspective: in the summer of 2010, Joe Johnson was a free agent. He had, somewhat nominally, become the #1 second-tier free agent behind James, Wade, and Bosh. The Hawks were in a bind: they could retain their best player, but only if they gave him a max deal. A deal that everyone, including the Hawks, knew he could not live up to, even operating under the most optimistic expectations. If they had refused, they would have “risked” falling out of the Eastern Conference short-list of perennial playoff teams. They would have lost their best player, and received nothing in return. These things never end well. Ask Washington, who gave Gilbert Arenas a similar contract for similar reasons: he was their best player, he made them competitive in the first round of the playoffs, and he was the face of the franchise. Joe Johnson’s time in Atlanta after signing his deal has been much less tumultuous than that of Arenas in Washington, but the hold that Johnson’s contract had on Atlanta’s available cap was tightening, and quickly. This year, he would have been owed $19,752,645. It would have escalated each year until the end of the 2015-2016 season, a season in which Johnson will be 34 years old, peaking at $24,894,863. Trading this contract (forget the player; unless it is LeBron James or Kevin Durant, it’s not worth it) was deemed impossible by almost every observer. Deals can sometimes be made, but they resemble that of the Arenas/Rashard Lewis swap, trading one bloated, indefensible contract for another. Atlanta just traded Joe Johnson’s contract for a smattering of below-average players that have extremely friendly, expiring contracts. As in “this is the only season you pay them” expiring. It’s a borderline unprecedented move. Not resting on his laurels, Ferry turned around and made a smaller, but nearly as surprising move: Marvin Williams (candidate for biggest rear end in the NBA) for Devin Harris (and his expiring contract). Again, the Hawks don’t have any plans to retain Harris after this year. Williams has a player option for 2013-2014 that he would be foolish to decline. Again, Ferry painlessly sliced salary off of the books for 2013-2014. Even if he does nothing else this season, Ferry should be in the running for Executive of the Year. There’s not really any precedent for an executive winning the award for subtraction, and Ferry probably won’t be formally recognized by the league for his work. The NBA doesn’t want to glorify the devaluation of on-court product to fans that have to watch a suddenly sub-par team. But unless someone pulls off a stunner, he absolutely should win it. Other than a liberated future, the Hawks have a few other strengths. Al Horford has All-Star potential, and Jeff Teague exceeded expectations at point guard. They are both young. Horford’s contract is substantial, but eminently manageable, even appropriate: $12 million per year, without increases. The Hawks should resist the temptation to completely reboot. Don’t trade Horford. See what happens with Teague. Draft well. Sign the right free agents, for the right price. Show that you’ve learned from the contract disaster you were enveloped by, even if you ultimately wriggled free. Trade Josh Smith during the season, when you have more leverage (via teams looking to contend this year), for good, young players whose deals you can control going forward. Or reach a reasonable deal with Smith, and move forward with him. Weaknesses: As currently constructed, the Hawks are not in great shape. They are hoping that Jenkins, who can shoot the lights out, will validate their choice to draft him. But a team that trades away their franchise player and sixth man will likely experience a downturn. Josh Smith is a really high quality player. He should have been an All-Star this past season. This panelist was in the stands this season at Philips when the Hawks took down the Oklahoma City Thunder, and Josh Smith was the best player on the floor. But he can also be frustrating to watch. Folks in the arena collectively moan “Nooooooo” when he pulls up for a jump shot anywhere outside of the elbow, and with some good reason. Without Johnson, the Hawks will have to work much harder to create shots, and to score. Even with Johnson this year, the Hawks too often looked out of sync. In the series with Boston, Atlanta went long stretches without being able to manufacture good shots. Without Joe Johnson on the court during the first two games, the Hawks were -50.3, compared to +13.2 with him on the court. The lack of a quality jump-shooter on this team (no disrespect to Jenkins, but I won’t count my chickens before they hatch) outside of the point guard will hurt them. Also, the Hawks still don’t have a quality center. 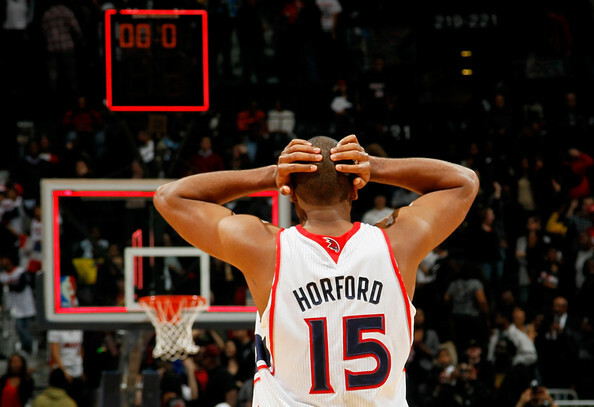 Horford is a power forward, and has been playing out of position for too long. He is a matchup nightmare for power forwards around the league, but can be backed down by some of the more physical centers. The Hawks owe it to Al to stop rotating a carousel of bodies with fouls to give at the five, and to find a guy they are comfortable with as an everyday starter. Chris Kaman (UFA, NOLA, C) – Kaman may well be the most hideous player in the NBA now that Calvin Booth and Michael Ruffin are out of the league (and Tyrone Hill, never forget). But he’s a really good center in a league that lacks really good centers. He also is coming off an awkward, down year. In the course of 2011-2012, Kaman missed games due to injury and also, more uniquely, after he was sent home to sit on his duff while New Orleans attempted to find a trade partner for him. No shame in NOLA’s tank game. But Kaman’s insane year could allow the Hawks to reap some benefits in the form of a lower payout. The Pacers have targeted Kaman as a backup plan to losing Roy Hibbert, but few other teams have showed genuine interest. Spencer Hawes (UFA, PHI, C) – Careful, here. Hawes could be a great pickup for the Hawks, a nice young player with good size to start at the center position alongside Horford for the next few years. But Hawes doesn’t possess a ton of potential, and shouldn’t be paid as if he does. Marco Bellinelli (UFA, NOLA, SG) – Bellinelli is a three-point shooter. He doesn’t rebound, he doesn’t get assists. But a career .393 three-point shooter has lots of value. Bellinelli, or “Belly” as he is colloquially known, should be available for a modest price, and will help the Hawks pick up some of the scoring slack. He is coming off of his best season, where he averaged almost twelve points per game. Ersan Ilyasova (UFA, MIL, PF) – If you’re going to play Horford at center, you could do worse than to sign Ersan Ilyasova as your power forward. He is a creative, and often prolific, scorer who has a knack for finding the ball on rebounds. This space would be reserved for Ryan Anderson, but there is no way that he will be reasonably priced after winning the Most Improved award. Gilbert Arenas (UFA, MEM, PG) – Hear me out! Don’t act like Atlanta is the one that has to write the massive check to him (that’s Orlando). Gil will be available for the veteran’s minimum. He wasn’t spectacular with Memphis last season. Frankly, even his most ardent supporters (this panelist included) didn’t expect him to be. He isn’t as fast, explosive, or nearly as confident on offense as he was in 2006-2007, before Gerald-Wallace/GunGate/Fingergunz/DepressionBeard happened. But he showed improved defense, a capable shooting touch, and even maturity. It’s a small sample size, but in 210 on-court minutes in 2012, he was +28. Anyone worried about personality issues should note that Gil, albeit complicated emotionally, does not belong in the malcontent pile. It’s a low risk, and probably low reward move that gives Atlanta an experienced combo guard to backup both positions. Dwight Howard (ORL, C) to Atlanta for Al Horford, Jeff Teague, and Jordan Williams. Going on the record here: the Hawks should not trade for Dwight Howard. DH12 is one of the five best players in the league, and has more defensive impact than any other individual player. But trading for him this offseason could be an absolute disaster. Dwight will be a free agent next offseason, and could leave the Hawks high and dry. Even if they can get him to “commit” to resigning in Atlanta after this year before making a trade, we’ve seen how much Dwight values these kinds of commitments. Compare these tragically oblivious t-shirts with Dwight’s recent reiteration of a trade request, even going so far as to hold Orlando hostage by specifically delineating the “only” (Brooklyn) team he would consider re-signing with following a trade. Horford and Teague are talented, manageable, coachable young players, and shouldn’t be thrown away for a chance at an immature, increasingly divo star. Josh Smith – Now is not the time to make a Josh Smith trade. As the season moves towards the trade deadline, Smith will look more and more valuable to teams looking to make a playoff push, and Atlanta, who won’t be looking for salary cap relief, can use their leverage for young, affordable assets. Here’s looking at you, borderline contenders.